Stratford Homes Timber Trail | Excelsior Homes West, Inc. If you are looking for a loft style home with a second floor master suite, the Stratford Homes Timber Trail may be right home for you! The Stratford Homes Timber Trail is a three bedroom, two bathroom home with just over 2100 square feet of space. This home features a second floor master suite that includes a walk-in closet, optional separate platform tub, and master bathroom (if you are looking for a similar floor plan, but with a main floor master suite-check out Stratford Homes Timber Bluff). On the home’s main level, you will find a spacious living room that opens up to the second floor loft. This home also features a large U-shaped kitchen with a center island. If this home sounds exciting and perfect for you, contact us today! Excelsior Homes West, Inc. is here to help you build your dream home! The Stratford Timber Trail can be customized with options and material finishes available through the manufacturer. 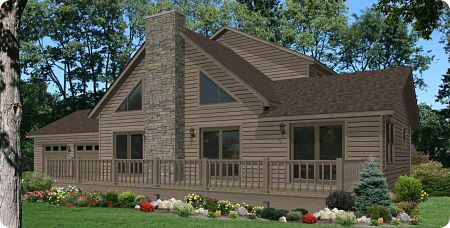 The Stratford Timber Trail is a spacious loft style home with the option of making it your own by choosing from different material finishes available. Choose from numerous possibilities when it comes to countertops, tile, flooring, cabinetry, exterior doors, exterior finishes, and much more. This floor plan also has the option of adding a platform tub in the upstairs master suite–great way to relax after a long day at work! Contact Excelsior Homes West, Inc. for more information and pricing details on this amazing home!